Because of a deep appreciation and understanding for Kansas and its flora, the staff of Hesston’s Dyck Arboretum of the Plains recognizes the subtleties of the beauty of Kansas in winter – as in every season – and works daily to educate others to it as well. 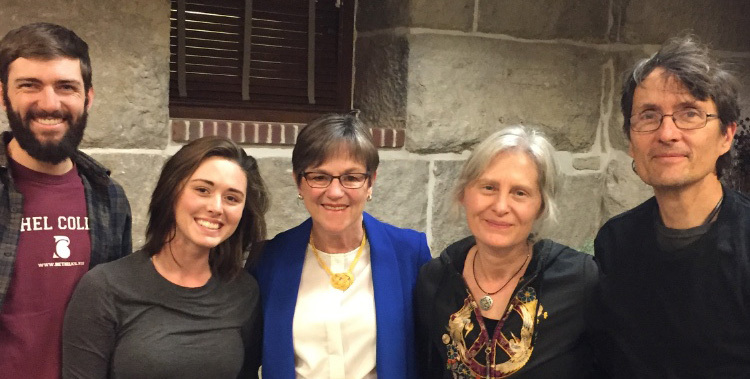 On a cold January day, they were able to spread the Arboretum’s mission and passion for Kansas nature to the state capitol of Topeka and to the highest seat of state government by playing a role in the gubernatorial inauguration of Laura Kelly. A few weeks prior to the Jan. 14 inauguration, Arboretum staff received a call from an Inauguration Planning Committee member asking about renting evergreens for a stage display. “She said she saw our website and loved it, and wanted to support a Kansas institution and a place with Kansas history,” said Arboretum Grounds Manager Katie Schmidt. As a public garden rather than a greenhouse production, the Arboretum wasn’t able to fulfill the initial request, but Schmidt persuaded her to consider floral arrangements using native plants instead. Floral arrangement made with native plants from the Dyck Arboretum. 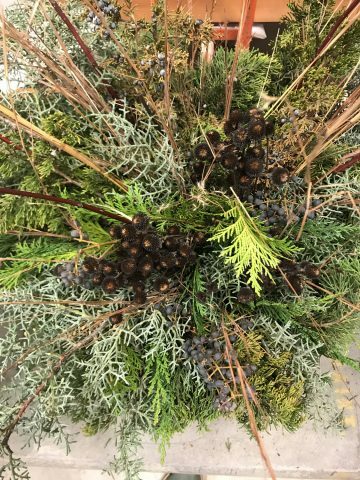 Schmidt collected native grasses, cedar cuttings and ornamental branches that reflect the Kansas landscape in January from the Arboretum’s 29 acres and delivered them to the florist. On her personal time, Schmidt assisted Blue Morning Glory with the arrangements. While it’s not in the business of doing floral arranging, the Dyck Arboretum, which is owned by neighboring Hesston College, does serve as a place for people to be educated about the Kansas ecosystem to be able to nurture native plants on their own. The Arboretum’s Native Plant School series includes several beginner’s classes on landscaping with native plants, responsible landscape practices, using native plants at home to attract wildlife and how to reproduce native plants. The twice yearly FloraKansas: Native Plant Festival in April and September is an opportunity to learn about and purchase native prairie plants for use in personal gardening and landscaping. In addition, the four-person Arboretum staff and a myriad of volunteers are always happy to share their knowledge of indigenous plants.